UnderrStand Bed Stand: great for reading books and watching movies on your iPad in bed or sofa. It is adjustable and can work well for couples. iCraze for iPad: an adjustable vented laid-back tablet and laptop table to use in bed. It is made of aluminum aloy and works for all iPad versions. Laptop Desk Table Transformer: use your laptop as your e-book reader? This stand gives you flexibility using your device around your room. 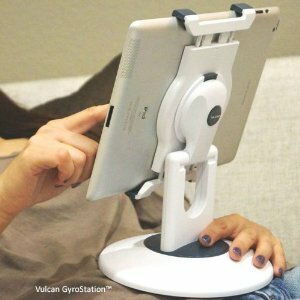 Vulcan Universal Tablet GyroStation: supports tablets between sizes 7-10 inches. It offers 360-degrees rotational view and multiple angles. You can use it in your bed, kitchen, pool, and car. iPad Desk: serves as a desk for your iPad but can also hold your book, laptop, and other gadgets. You can easily use it in bed. Which one of these bed stands are you impressed with the most?